When Israeli economists contemplate their country’s untapped natural gas finds far out in the Mediterranean, they dream of energy independence and lucrative export deals. Those charged with Israel’s defense, however, worry that the navy – small and long a middling priority in budgets – may be hard put to protect the multinational drilling platforms and rigs out at sea. “We will do our best, but without a major boost to our capabilities, our best will not be enough,” a senior military planner said in one of a series of Reuters interviews with Israeli decision-makers on the subject. That all spoke on condition of anonymity indicates concern that such doubts over security might scare off investors and, perhaps, even encourage sea-borne attacks by Hezbollah, the Iranian-backed Lebanese guerrilla movement hostile to Israel and to its exploration of gas fields also claimed by Beirut. There are internal political considerations, too. With Middle East instability spiraling, Israel’s Finance Ministry is poring over an unwieldy plan for fiscal cuts combined with new spending on national security. The navy is lobbying for cash but is loath to challenge Prime Minister Benjamin Netanyahu openly. Maps and other dry facts speak amply. The huge gas fields centered 130 km (80 miles) from the port of Haifa in northern Israel, along with Yam Thetis, the existing gas-production rig just off Ashkelon in the south, make for a body of water covering 23,000 square km (9,000 square miles) – more than Israel’s territory on land. Guerrilla raids from the north appear the main threat, with Palestinian Hamas militants penned in Gaza to the south and rumbling discontent from the Lebanese government over Israel’s drawing of a maritime border unlikely to take a military turn. Providing rapid response in an emergency would strain the Israeli fleet of three corvettes – which have a crew of about 70 and can carry helicopters – 10 other missile boats and fast patrol vessels, and three diesel submarines, not least given their existing roles of enforcing the Gaza Strip blockade and the occasional foray through the Suez Canal to the Red Sea. “You would need to have at least two missile boats in the vicinity of the rigs at all time,” said a senior officer. Another declined to give a specific number, saying only the navy required “several” new vessels to meet future missions. That would mean major expansion of the fleet – a tall order, not least as Israel bought another submarine for $335 million in March. Visiting Israeli joint defense headquarters in Tel Aviv reveals the navy’s junior status, its cramped command centre overshadowed by the marbled tower of the well-funded air force. The navy also faces skepticism from an Israeli cabinet stiff with former army generals and a finance minister, Yuval Steinitz, who is a civilian expert on maritime security. In the spirit of what Israelis mordantly call their “ad-hocracy”, an unwillingness to spend on things that seem less pressing, the government may not agree with naval commanders about the urgency of protecting gas fields which are years away from being fully exploited and operational. One of the handful of gas development projects under way, Tamar, has finished a well 70 km (45 miles) from Haifa. 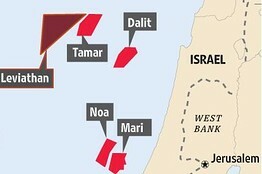 An underwater pipeline will run from there to a production rig that will be erected next to Yam Thetis, 25 km (15 miles) from Israel’s southern coast, by July 2013. Another project, Leviathan, is 130 km (80 miles) off Haifa – a remoteness from shore that would itself appear to provide protection from guerrilla raids – and is not expected to produce gas before 2017. A number of firms hope to find undersea oil reserves, as well as the gas. Robin Mills, head of consulting at Manaar Energy in Dubai, predicted an eventual increase in such activity off Israel and Cyprus, with several new exploration wells supported by supply ships and pipe-laying vessels. Like its foreign counterparts, Israel’s navy prides itself on a spit-and-polish proficiency, especially in carrying out missions of strategic importance. The officers who spoke to Reuters chafed at the idea that, in a fix, they might be forced to call on NATO powers which sail the Mediterranean, such as the United States. The Israeli navy has fended off a variety of threats over the decades, including at long range. Last year it captured anti-ship missiles which Israel said were destined for Palestinian guerrillas in the Gaza Strip. From there, the weapons could potentially have been used to blow up Yam Thetis. Citing intelligence assessments, the navy fears Hezbollah guerrillas in boats could fire similar missiles against Israeli targets in the northern gas fields. Other scenarios include remote-controlled flying bombs crashing into rigs, or miniature submarines striking from below. A separate possibility is of gunmen approaching the platforms in civilian vessels or with divers’ gear, then storming aboard to kill or capture the crews. “We designated these kinds of attack as having a ‘reasonable likelihood’ of occurring,” one Israeli officer said. Anthony Skinner, Middle East analyst at London political risk consultancy Maplecroft, voiced doubt about the imminence of any such incident. He argued Hezbollah has a role as a reserve reprisal arm of its patron Iran, should the latter’s controversial nuclear facilities be bombed by the Israelis. “Were Hezbollah to target gas platform and production rigs, such an attack would likely provoke a robust response from Israeli forces, which may in turn precipitate a broader conflict. One of Iran’s key cards against Israel would be removed from the table,” Skinner said. But merely menacing the energy assets could have value in the eyes of Hezbollah and its allies: “It is altogether conceivable that Hezbollah will seek to deter or frustrate Israeli extraction. Iran too does not want Israel to be able to exploit massive oil and gas wealth in the Mediterranean,” Skinner said. Though outgunned by Israel, Hezbollah guerrillas fought its army to a standstill in a border war in 2006 and have since maintained a tense standoff while making clear they are honing their military capabilities for any new conflict. Sayyed Hassan Nasrallah, the Hezbollah leader, indicated in a speech last July that any attack on Israeli offshore gas facilities would be in retaliation for an attack on Lebanon. Israel’s navy says that in addition to enhancing its own fleet it expects stepped-up air force patrols of the gas fields and espionage further abroad. “If there is a Hezbollah guy training in South America to attack a gas platform, we want to know about it,” an Israeli officer said, speaking hypothetically. There is hope for stop-gap measures such as unmanned, machinegun-equipped naval patrol boats that can travel long distances and remotely challenge suspect vessels. Navy officers also hint at the development of electronic counter-measures that would allow gas rigs to block incoming guided missiles. “The IDF knows how to provide a response for all of Israel’s military needs,” said Ohad Marani, a former Finance Ministry director-general and now CEO of ILD Energy, which plans to begin drilling the first of two new offshore wells in June. Texas-based Noble Energy, the main foreign company developing the gas fields with Israel and its maritime neighbor Cyprus, declined to discuss security measures for the platforms. One of the Israeli officers said the rigs had private guards who coordinate closely with the navy. But they have not yet held sufficient joint emergency drills, the officer said, citing reluctance to disrupt work that costs around $1 million a day. That leaves the hope that Hezbollah will shrink from the geographical, and geopolitical, hurdles of strikes at sea.